Dutch site Tweakers.net (, via Engadget) performed the GLBenchmark test on the two generations of iPads for five minutes to measure a heat difference. Using an infrared camera, the publication discovered that the hottest part of the new iPad was 33.6 degrees Celsius (92.5 Fahrenheit), while the iPad 2 measured 28.3 degrees Celsius (83 Fahrenheit). That bottom-left corner (bottom right in photo) definitely gets warm to the touch. The simple solution is to rotate the iPad 180 degrees. I'm surprised that it's only 10 degrees Fahrenheit. I had never noticed the previous iPads getting warm and this one can get uncomfortable. has anybody else found that the on-line apple store is currently off line? new mac pros coming today? Yes. It's in a "We'll be back soon" state. Well, with three million sold on launch, I think it was already fair to call the new iPad "hot". I don't think it can until the 4th gen iPad outside of some iOS update that clocks the GPU lower, which I assume they had a razor focus on before its release. I can't be certain but based on lead times for development I expect Steve would have had in his hands the new iPad with its thick battery. It's a trade off and drastically less battery life was not an option. Note that Apple has has been a leader battery life a this directly affects the user experience. Also note Apple, under Jobs, has released thicker and heavier iPhones in subsequent releases. This is the most drastic but the display is 8x the area of the iPhone. Bottom line: The iPad will get thinner and lighter as the technology permits. The issue is with the display requiring a very powerful GPU. As the article mentions they moved the RAM from being on the Apple ASIC (A5 chip) to being external to the package and having its own her sink. That GPU need a low of power to push pixels to that display. That needs a larger battery. I assume this will get somewhat resolved next year but it will probably be a few years before a 25W battery is feasible again. I'm surprised by how warm my new iPad gets, but that's only because I never noticed my previous iPad 2 being even warm at all. I'll be curious to see how this all plays out. Do LTE iPads run hotter than wifi iPads (mine is wifi). I think mine runs hotter when in use while charging. It ran the warmest during the very first use as it was charging in the dock and installing gigs and gigs worth of data, music and apps. It's certainly warm, but I wouldn't say hot. Is this something that only happens to a small number of units? Mine always seems cool to the touch. Seriously. I usually have the 'smart cover' over the back, but after I use it for a while and close it the back is pretty cool. Like that cold metallic feeling. I would like to see a FLIR (great company by the way) image of a Tegra 3 being 'bench tested'. If it has both 4 CPU cores and 4 GPU cores, plus a 5th (downscaled) core, then i would imagine it would be burning hot by FLIR standards. 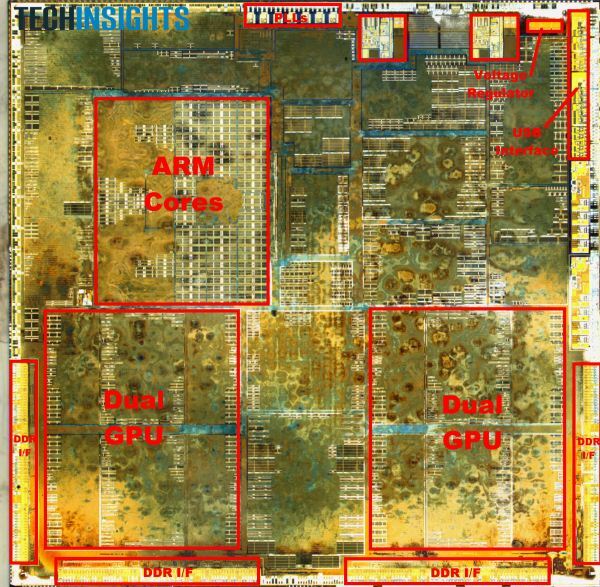 Heck, I've read some apple hate comments saying the Tegra 3 has 12 cores and all the bench marks are faked... (totally wrong BTW). I may be wrong, but I don't believe it's the new processor. I love reading your thoughts though! Fahrenheit! You Americans use quaint lingo.. I'm just glad that there's no damn fan in the iPad. I hate noisy electronics and computers. I can definitely notice that the new iPad is a little bit warmer during use than the iPad2, but it doesn't bother me because I understand that the extra graphics power is needed to drive that super crazy display. That's also why the battery has been upgraded. With increased power in the iPad, comes more chips, which generates more heat. I would suspect that designing something as great as the iPad is a fine balancing act, and nobody does that better than Apple. O.K. 45 min of streaming LTE(4G) and the back of mine is still 'cool to the touch' so to speak. It's not hot at all. It not even WARM. I left it 'back' down on a room temperature desk, with the smart cover under it (it's leather, which holds heat well). After a 44min. show, it was metallic cold to the touch. On every corner! I'm starting to think that either I'm lucky, or the heat thing is just troll stuff. I thought that at first until I had seen this article from AI. Is AI feeding off troll bait? It just doesn't make sense. 95 degrees is a great bun warmer. LOL. I always found the iPad 2 to feel cold in my hands, especially at night so the new iPad actually being a bit warmer is a good thing. No issues with overheating of any products for me as the climate here is ideal for electronics. I live in Scotland. You're doing it wrong. Forget about LTE. I would suspect that these two huge GPU's have something to do with it. With increased power in the iPad, comes more chips, which generates more heat. Strange, my brother kept saying today "With increased power, comes increased responsibility." I don't know why, but I found your post funny! So why then isn't the Tegra 3, burning people's finger prints off? 4 "Huge" GPU's plus I would guess 4 "Huge" CPU's, but wait, there's a fifth... oh, and if you look at other blogs, I guess it has 12 cores. Not just Americans. At least Americans own* it while Britons have some wonky usage where they use Fahrenheit in the Summer to exaggerate the temperature. It is rather odd that the since France started metrication in the late 1700s that the nearly all the world has adopted it except, inarguably, the most powerful nation on the planet. That seems rather odd to me but if the UK can't get on board and they are part of the EU would chance do 350 million Staunch Americans have. I remember being in grade school being told that I need to learn the metric system because it will be standard in a couple years. I later found out this has been told longer before I was in school and long after I was in school. I'm sure it's being told to kids today. PS: i used Fahrenheit because that is the 10 degrees noted in the article, though oddly omitted from the title. * Own, as in make use of it fully, not a pronouncement that we invented it. That title goes to geman physicist Gabriel Daniel Fahrenheit. What model are you using to compare them? The results from the Tegra 3 showed it was mostly inline with the iPad 2's GPU performance. Are you just looking at cores? Note that Apple's A5X is about 4x the area of the Tegra 3 which includes RAM on the package. I think you are seriously under estimating what is required to fun this display.